Not so long ago, an academic medical center (AMC) could take five years or more to identify a major health risk in a specific community, design and implement an intervention, and see improved outcomes. Today, all this can happen in a matter of months thanks to an ability to aggregate data and identify patterns of illness. The ability to quickly gather and analyze data has the potential to revolutionize research and clinical practice, according to Lloyd Michener, MD, a professor at Duke University School of Medicine and chair of the Department of Community and Family Medicine. And it is just one way academic medicine will be evolving in the next 10 years. 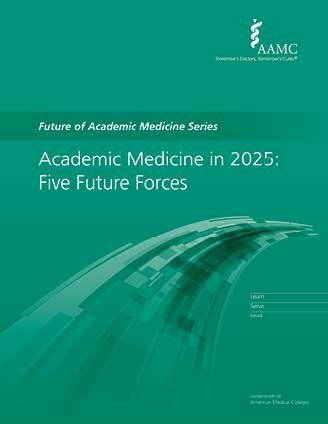 The coming changes, and how leaders in academic medicine can prepare for them, are the focus of a new AAMC report, Academic Medicine in 2025: Notable Trends and Five Future Forces. Part of the AAMC’s Future of Academic Medicine Series, the report is a collaboration of the AAMC and the Institute for the Future, a nonprofit research organization. It aims to inspire leaders at AMCs, medicals schools, faculty group practices, and universities to make “sustaining, future-oriented decisions” today by thinking about how current trends could intersect with external future forces to affect academic medicine over the next 10 years. The report notes several demographic, epidemiological, economic, and educational trends that will continue to inform medical education, research, and patient care. But the bulk of the report focuses on five external future forces. These changes in tools, practices, behaviors, and norms include on-demand learning, flipped clinics, networked discovery, high-resolution health, and rapid prototyping cycles. The combination of these future forces and linear trends could lead to large cultural, social, and technological shifts over the next decade. Examples of future forces are beginning to percolate at medical schools and teaching hospitals. Researchers at Duke, for example, are participating in high-resolution health, using big data to identify health risks and behaviors in precise locations and develop targeted interventions to address asthma, obesity, and other chronic conditions. Technology will continue to inform education and health care delivery, according to the new report. Learning will take place across a variety of mobile platforms. Many medical schools already use on-demand learning, an innovation of disruption that is expected to evolve in the next decade. Virtual clinical care is another disruptive force. The Virtual Care Clinic at the University of Southern California (USC) Center for Body Computing, for example, does not require patients or care providers to be present in the same place, allowing for on-demand medical care. “This health care model will empower patients, improve quality outcomes with more precision medicine analytics and diagnosis, and enhance the physician-patient relationship by creating a contextualized experience and seamless communication that puts the patient in the driver seat of their own health care experience and outcomes,” said Leslie Saxon, MD, executive director of USC Center for Body Computing and a professor of clinical medicine at Keck School of Medicine of USC. AMCs, medical schools, and teaching hospitals can use the report to support their transformation efforts. “Strategic foresight is a competency for all of our member institutions to master,” Mallon said.